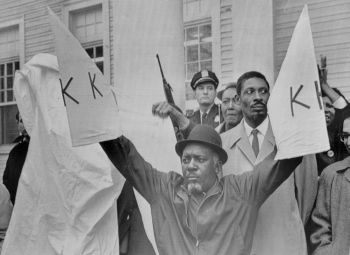 On July 10, 1964, a group of African American men in Jonesboro, Louisiana led by Earnest “Chilly Willy” Thomas and Frederick Douglas Kirkpatrick founded the group known as The Deacons for Defense and Justice to protect members of the Congress of Racial Equality (CORE) against Ku Klux Klan violence. Most of the “Deacons” were veterans of World War II and the Korean War. The Jonesboro chapter organized its first affiliate chapter in nearby Bogalusa, Louisiana led by Charles Sims, A.Z. Young and Robert Hicks. Eventually they organized a third chapter in Louisiana. The Deacons tense confrontation with the Klan in Bogalusa was crucial in forcing the federal government to intervene on behalf of the local African American community. The national attention they garnered also persuaded state and national officials to initiate efforts to neutralize the Klan in that area of the Deep South. The Deacons emerged as one of the first visible self-defense forces in the South and as such represented a new face of the civil rights movement. Traditional civil rights organizations remained silent on them or repudiated their activities. They were effective however in providing protection for local African Americans who sought to register to vote and for white and black civil rights workers in the area. The Deacons, for example, provided security for the 1966 March Against Fear from Memphis to Jackson, Mississippi. Moreover their presence in Southeastern Louisiana meant that the Klan would no longer be able to intimidate and terrorize local African Americans without challenge. Lance Hill, The Deacons for Defense: Armed Resistance and the Civil Rights Movement (Chapel Hill: University of North Carolina Press, 2004); Deacons for Defense and Justice in Africanaonline. 2004); Deacons for Defense and Justice in Africanaonline.